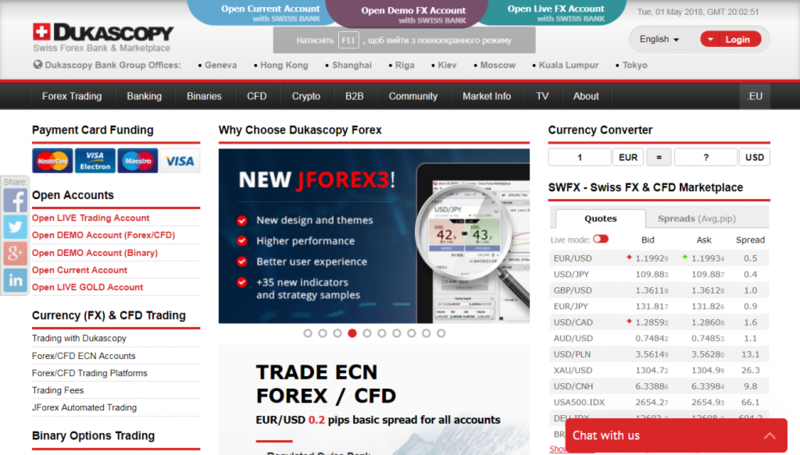 Dukascopy is, in fact, the Swiss online bank (DukascopyBank), which, as a bank and as a securities dealer, is regulated by the SwissFinancial Market Supervisory Authority (FINMA). DukascopyBank has been operating in the financial market since 2004 and has a head office in Switzerland. This broker provides active traders, hedge funds and banks with the ability to make transactions in the Forex market. Also, the company has offices in Geneva, Hong Kong, Shanghai, Riga, Kiev, Moscow, Kuala Lumpur and Tokyo. Since 2011, Dukascopy has added to its arsenal the possibility of trading binary options. As a broker, Dukascopy uses NO Dealing Desk and STP technologies, in addition to auto-trading in the ECN environment. Also, the broker assures all its customers that all their accounts, without exception, go directly to SWFX (Swiss FX Marketplace). And this gives everyone, having the same level of liquidity, regardless of the size and / or type of the trading account, an automatic guarantee of access to the same quotes, which, according to the company, excludes fraud. Dukascopy provides services such as: trading in the Forex market, VisualJForex is a strategy designer, JForex API is a service for developing individual software applications, SWFX is a trading platform with access to a decentralized market, Investing, Social trading, Internet banking, Affiliate programs, and Training. SWFX (Swiss Forex Marketplace) – will appeal to experienced players. JForex is a platform ideally suited as development and testing of trading strategies both in the mode for manual trading, and for auto-trading, using the API service. Java – allows you to monitor the positions on the chart with tools for technical analysis, which is perfect for manual trading. Web-platform – well suited to adjust the frequency of updates of quotations of the market. SWFX Trader for Apple iOS and Android and Swiss Forex Trader HD for iPad. The trader has the opportunity to open a trading account in USD, EUR, AUD, GBP, CHF, CAD, JPY, PLN, RUB, DKK, HKD, ZAR, NOK, NZD, TRY, SEK, SGD and MXN. But first, to open a real account, the broker provides an excellent opportunity to bargain on the Demo account. If you have decided and want to open a real account, then the initial replenishment of the deposit must be 100 USD- for European customers of DukascopyEurope and from 5,000 USD for customers of DukascopyBankSA. Trader is available to trade in the form of trading on news, scalping, hedging, etc. Spread – from 0.2 points. The commission with CFD will be 10 EUR, and for currency pairs will depend on the volume of transactions. Important note: The broker charges the account maintenance fee from each trader in the amount of 0-200 CHF per year, and also has the right to open a trading account – if there was no activity for 360 days. In the context of binary options, the broker offers trading in binary options for currency pairs, binary options for the trading session and for shares, as well as paired binary options for indices and shares. The minimum bid for binary options is 1 USD. Also, the expected yield from transactions on standard binary options will be 70-90%, and for paired binary options, as well as binary options for the trading session fluctuates in the range from 50% to 70%. For the duration of the contract for standard binary options, the minimum value is 1 minute, and the maximum value is 23 hours 59 minutes. But, in the case of binary options for the trading session and paired – is equal to the duration of the trading session itself, where the underlying asset can not be chosen by the trader himself. Here we use the trading platform – WebBinaryTrader. With regard to incentives and bonus programs, the broker provides for the participation of traders in the “Jubilee Bonus” program. This program allows you to get a bonus of 100% balance of the trading account for 30 days after the last payment. Replenishment of the trading account, as well as withdrawal of funds from it, is possible by bank transfer (1-2 business days) or debit card (Maestro, Visa Electron), credit card (MasterCard, Visa), (within 1 working day ). But, the broker does not accept bank checks or cash for replenishment of account. (!) Important: Remove the physical gold from the account denominated in gold, perhaps only in currency equivalent. 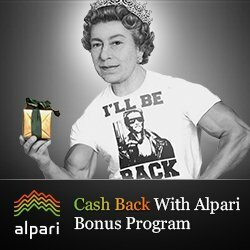 The maximum amount of replenishment by credit or debit card is CHF 10000 / USD 10000 / EUR 8000 / GBP 7000 / CAD 10000 / JPY 1000000 / PLN 34000 / SEK 70000 / NOK 70000 / CZK 200000 / RUB 500000 depending on the currency. In addition, the commission of the partner bank levies a commission: – 1.2% of the transaction amount in EUR, GBP or CHF; – 1.5%, for operations in NOK, CZK, PLN or SEK; – 2% for transactions in USD and 2.3% for transactions in RUB, JPY and CAD. The broker constantly conducts webinars broadcast on Dukascopy TV – the company’s website, and seminars in various cities, on topics chosen by the clients themselves. In addition, everyone can view educational videos for free. – The broker does not render services to clients from Belgium.